The next generation of tent pegs can be screwed in with an electric drill! 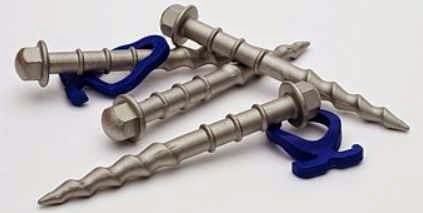 Five times lighter than a conventional metal peg but with ten times better grip, equally suitable for hard, stoney ground by using the height-adjustable hook. The next generation of screw-in-pegs are 20% thicker, 1.8cm longer and 30% stronger than our previous pegs. They also have a newly designed more versatile stronger clip that increases the holding power. 'Pegs arrived Tuesday am - Brilliant service, considering only ordered mid-day Monday. Very fair delivery charge too! They look great and if they perform as well as the ordering service, should be fantastic!" "Thank you for the prompt service, sending my Peggy Pegs to me and the information you gave me over the phone. So far I am pleased with the pegs and will be putting them to the real test in less than 2 weeks"
Caravanning design award: innovations for new mobility.